We all know that there’s a right way to do things and a “cheating” way, but it doesn’t matter which one you use as long as the end result is the same, right? 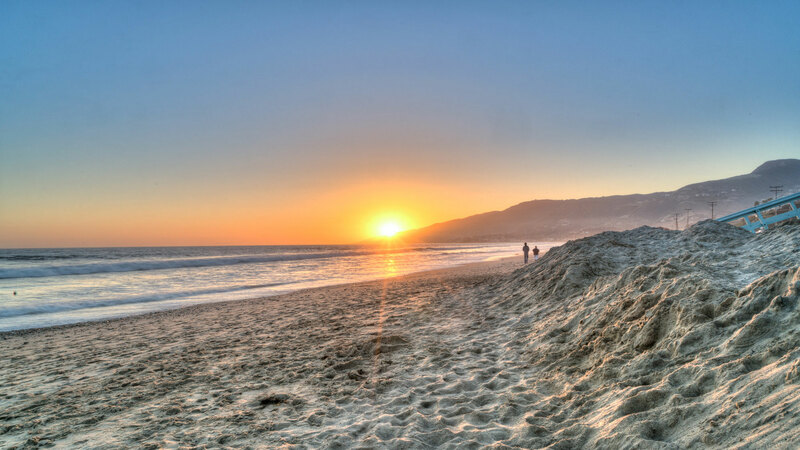 A few months ago, I was on Zuma Beach in Malibu for sunset. Even though the dynamic range is incredible on the Sony A7r II, I still opted to shoot bracketed images “just in case”. After I merged them into an HDR image using Photomatix Pro, I needed to fix the sky. It looked dark and weird, compared to the blue sky I saw during sunset. Maybe it’s the LA smog, but I need to fix it. Without wanting to deep dive into Photoshop, I decided to make use of Lightroom’s Graduated Mask tool. By dragging it over the sky (and a little into the sand), I instantly created a mask. Next up – tweak the settings. Knowing that I wanted the sky bluer, I first tried increasing the saturation. Unfortunately, that didn’t work because the sky was so discolored coming out of Photomatix. Not thinking any of the options would work, I started playing with the sliders in the mask options and got the look I wanted by changing the white balance. Makes sense…I want bluer skies, so let’s cool down the white balance. Notice in the screenshots that it didn’t take much to get the results I was looking for. As with anything, there are other ways to do this inside of Lightroom. I could use the HSL panel and adjust the blue luminance and saturation or I could use the adjustment brush and paint the sky. Regardless, maybe tweaking the white balance is cheating…but it worked quickly and easily. It won’t always, but it’s a nifty trick to keep in your pocket. Have you tried Photomatix Pro 6 yet? I can’t get it to work past the preview screen so I can’t use it, but it has an adjustment brush and color adjustment capabilities in it now. I’m hoping to hear from customer support soon to find out why it’s acting up but if it were to work it sounds as if it may be able to address some of these issues from withing the progam. I’m using it with no issues. The brush doesn’t;t do a gradient yet, but it is useful for secondary color correction. Good to know. I heard from customer support and my issue was known to them and they have issued a fix. I will try it out today.